After my mother died, I had the enormous task of sorting through her things and emptying the condo. It took me ages before I finally sat down to go through her recipes. Like her daughter, Mama had piles of recipes she had set aside and meant to try one day. When I found this one for chicken borscht I knew I had to try it. 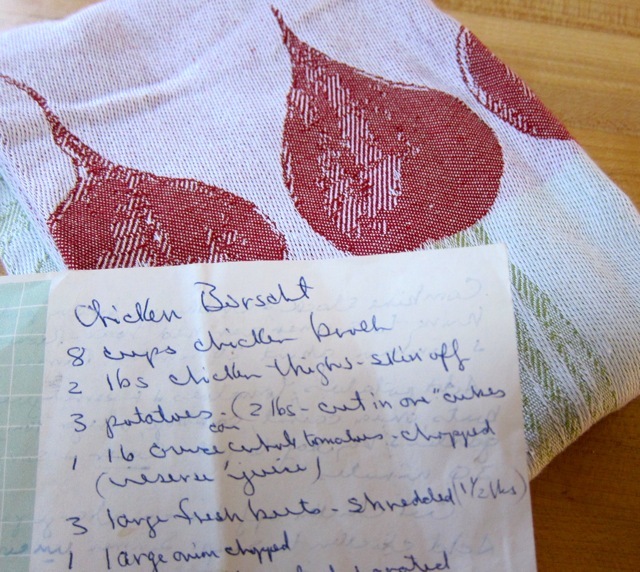 This chicken borscht was copied some time ago, judging from her firm penmanship. It lacks the smears and splatters that indicate a recipe has been prepared at least once. The pinkish-red Chioggia beets at the Coronado Farmers Market looked lovely and fresh, with their candy-cane striped insides. Any kind of beet would work here, however, and I’m thinking of trying my favorite golden beets for the next batch. I made my usual tweaks to the recipe – dicing instead of grating the beets, and using a bouquet garni instead of a bay leaf – and decided this first batch of soup in the new year would be made in my mother’s honor. I think she would have approved. 1. Using a large, heavy-bottomed pot, combine the stock and chicken and bring to a low boil over medium heat. Reduce heat to low and simmer for 20 minutes. 3. Add to the stock the potatoes, tomatoes, beets, onion, cabbage, vinegar, tomato paste, garlic and herb bundle. Season with salt and/or pepper. Cover pot and cook on low for 30 minutes. 4. Cut the cooked chicken off the bone and use your fingers to shred into bite-sized pieces. Add the chicken to the soup and simmer for 20 more minutes. 5. Remove herb bundle and discard. Ladle soup into bowls. Garnish with a dollop of sour cream and a sprig of fresh dill. Serve. What a wonderful variation of borscht. I love the chunky presence of vegetables and chicken. See what I mean about beets on the brain for us both? What a lovely post. This looks like a delicious and hearty meal and those beets are so pretty! Thanks, Sonali – will be supper tonight with some crusty bread and a salad. 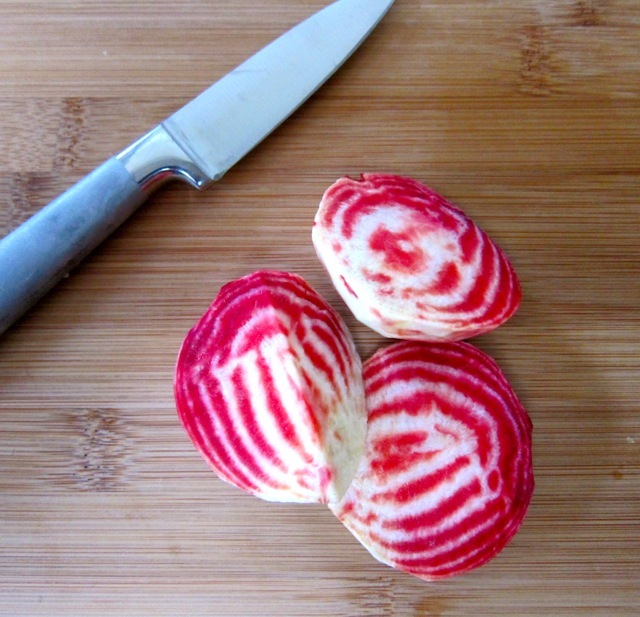 Wonderful sounding and looking recipe…those beets are gorgeous! I just happen to have some(plain) beets and I have never made borsch so I am going to make this. Your Momma would have approved 🙂 I am looking forward to trying this soup, I adore beets! Luckly we purchase them by the case with greens on for my pickling! Thanks, Wendy – we are still enjoying your jams. Hiding the raspberry-chocolate in the fridge – who wants to share?! Just realized you’re hosting Dianne J in a month or so as part of the SDFBlogger’s group. And I happen to live in Mission Hills/Hillcrest. Signing up! Not sure how I missed it…or don’t “know” you….we’re neighbors it sounds like! Wonderful! Hop to it – only 1-2 spots left. Do you need the link? Beautiful beets! What a lovely tribute to your mom, too. She had lovely penmanship. Kim, It might be even prettier if you used orange or red beets – the Chioggia ones kind of fade the more you simmer the soup. Good luck! Lovely photos, Liz and a great sounding recipe! Thanks, Susan, I will make this again – and it freezes beautifully. Trying to have homemade “loso” soup around all winter. This looks so hearty and delicious, and such a heartfelt post. Carol, I’m still so impressed with the boule you and your daughter baked earlier this week. Such a sweet post, Liz. 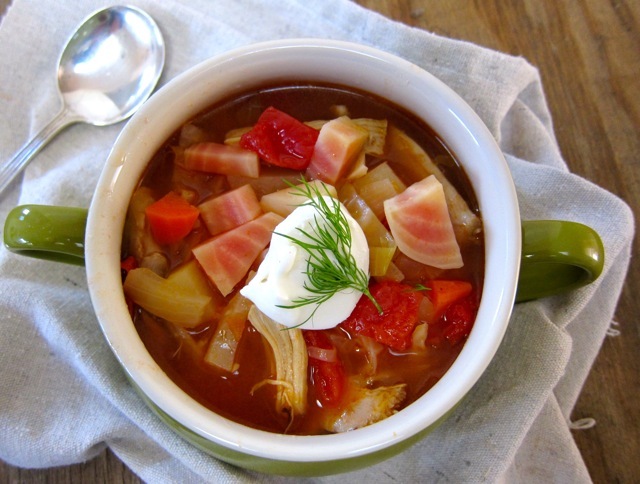 I love borscht but almost never make it- i love the chicken in here…such a nice way to add protein and make it really hearty. Thanks, Winnie, I laways love the winter/cold weather soups that you post – they inspire me. What a treasure to have your mom’s recipes. I have my moms poems. I adore borscht too, thanks for the great recipe, I’ve never made it before!